Due to a burst heating pipe and flooding in the new Christchurch Outpatient building on Friday 29 March most outpatient appointments were being postponed and rescheduled. All services apart from Diabetes and Endocrine services and Ophthalmology [the Eye service] will be back in their usual locations in the Outpatients building this week [from Monday 15 April 2019]. People who have appointments with the Diabetes service are being seen in a different location. Some people with essential eye appointments are being seen in alternative locations, with a only a small number being seen in the Outpatients building from Monday. However, some eye appointments for this week have had to be rescheduled. People who have appointment letters or texts should continue to turn up to the location on the letter unless you have been contacted and advised otherwise. If you’re not sure where to go please call the phone number on your appointment letter. We apologise for the inconvenience this flood has caused. You can read more about the temporary closure of the Christchurch Outpatients building in Health News. Christchurch Outpatients is the new outpatients facility at Christchurch Hospital. It provides a wide range of outpatient services over 5 floors of a new building. Christchurch Outpatients main entrance is at 2 Oxford Terrace. Please check your outpatient appointment letter to make sure you end up where you’re meant to be for your appointment. 7:15am – 5pm weekdays, excluding public holidays. Please see the information listed below about parking and transport for patients using Christchurch Outpatients services. The hospital shuttle service from the Lichfield Street Car Park building drops patients off and picks them up at the new Christchurch Outpatients building. The drop-off/pick-up point will be at the entrance of the Outpatients building on Oxford Terrace. For more information on the hospital shuttle, see our Christchurch Hospital parking page. We recommend using the hospital shuttle bus service from the Lichfield Street Car Park building, as there is only very limited on-street parking near the Outpatients building itself. If you prefer to try to park nearer the hospital the nearest off-street car parking to the Outpatients building is a Wilsons car park on Antigua Street, but there are several other care parks within a short walk. See the City Council’s website for an up-to-date parking map. See Christchurch Hospital for more detailed information about parking and transport. If you are a mobility parking permit holder you can park in one of the designated mobility car parking spaces (indicated by a wheelchair icon on the map below) located outside the front of Christchurch Hospital, Christchurch Outpatients and nearby on Cambridge Terrace. Drivers can drop patients off and pick them up – no waiting! – outside the building and park elsewhere. This area is very congested, including deliveries to the building, cyclists and pedestrians. Volunteers and security personnel will be on hand to assist. All drop-off parking is P5 – Drop-off only. Mobility parking is P30. See this short video for more information. If you cannot see the video on this page, you can view it on Vimeo. Several main bus routes travel directly past Christchurch Outpatients (see metroinfo.co.nz for more details). There are bus stops within 50 metres of the building on both sides of Tuam Street. 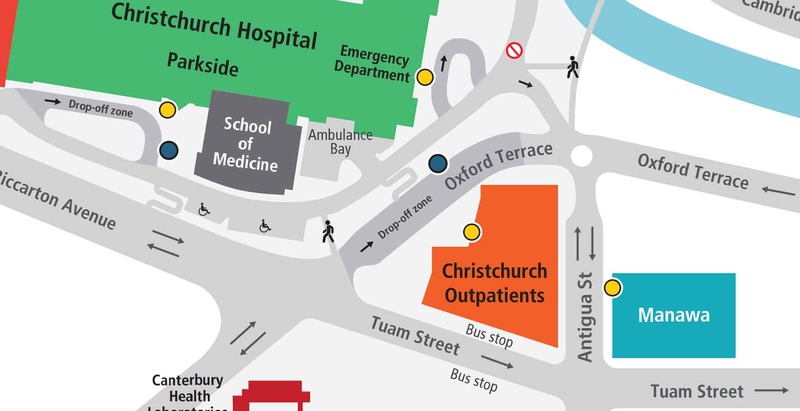 The main entrance to Christchurch Outpatients is at 2 Oxford Terrace, the entrance is indicated by the yellow circle on the orange building on the map below. There is also a rear entrance on Antigua Street. There are staff and volunteers in ground floor reception to help direct patients to appointments. Large signs indicate locations of services. There is a reception area on each floor. The main entrance to Christchurch Outpatients is at 2 Oxford Terrace, as shown by the arrow on the map. Until mid-December 2018, the rear entrance will be used, at 245 Antigua Street. The outpatient services at Christchurch Outpatients are as follows, floor by floor. Each service has its own reception desk on the appropriate floor. Kānuka is a new café on the ground floor of the Christchurch Outpatients building on Oxford Terrace. 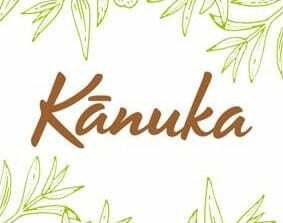 Kānuka serves gourmet sandwiches, fresh salads, quality Allpress Espresso coffee in a light relaxing atmosphere. There is also a range of gluten free, dairy free and vegan options available. The café also has a convenient new ordering app available free from app stores. Simply search ‘Kānuka’ and download it to your mobile device. Kānuka’s summer hours of operation are Monday to Friday, 7am – 4pm.